Well today i decided for some reason to make the biggest to-do list ever and i have managed a few, but i am running low on energy due to not being able to sleep lastnight to many ideas going on in my head and i feel a little bit weird im missing the boyfriend who is camping in cornwall with his family for an entier two weeks i’m sure right now as a i type this he is in a field getting wet by the wonderful english rain ha! So one of the ideas that i had last night whilst laying in bed and listening to Laura Marling, was to make some bespoke Jewellery this is what i have been doing for years since i could remember i wasnt using antique/vintage pendants then though, i have had these strange pendant cases for about 3years and i have never really used them to their full potential so i woke up decided to print my favourite illustrations and place them inside the case. This necklace will be avliable to buy on my Etsy store, i have made only one of these so it is a true one off and an original idea so i am really excited atm i am trying to source some plain lockets to some how put my illustrations on the front i hope everyone heads over to my etsy site for a we butchers. I am really sorry if the blogs colloum seems really crowded with stuff, i have tried to create a 3 colloum Html but i am finding it really hard to edit i was sent a ‘how to’ but i am pretty impossible when it comes to editing and stuff like that haha so give it time and it will soon look less cluttered and more viewable. So yesterday i started work on my new illustration with the lady with a bow in her hair and if i new that by posting a picture of me holding the image would have created people to formspring me questions about weight and ‘fat’ness i would never have bothered, my blog is here to create a way for me to get my illustration out therre not for people to sit behind their screens in comfort and judge others and ask personal and horrid questions, i was talking to the lovely Lily about this (who has been also subject to horrid questions via her formspring) and i do belive that if you head to this blog or any other it should be because you want to read it and not be-little the person creating, i am doing this for a positive thing and not a negative thing and if you dont like that or you dont like my illustration fine but dont be so judgemental, i did my degree in Fine art so i can take ridicolous personal critisims so really your wasting your time….negativity and rant over here is my illustration of the lady with ginger hair. i had to photgraph it because it was a little to large for my scanner, and there are lots of rubber shavings on the page very unprofessional haha. Previous Post Rolls of Film for SALE! i am in love with these! oh i wish i had money…. oh, this necklace is so pretty! i adore teacups so this is just perfect! thank-you for your beautiful necklace today, it can easily be fixed so not to worry! at the moment it's hanging up in my bedroom 🙂 sorry to hear about what was said on your formspring. The necklace is great, you should definitely make more! I like the sparkles on the lady, very pretty. And people sending nasty comments is just ridiculous, if I don't like someone's blog or the blogger themselves I just stop reading it! People really need to start living by the rule that if you can't say anything nice you shouldn't say anything at all! 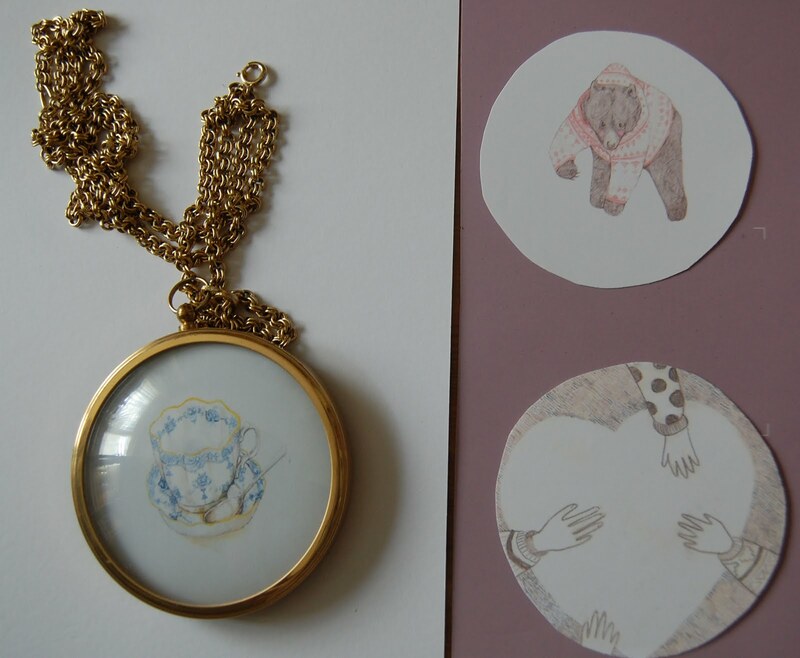 love your sketches and your necklace!